Our Top 100 of 2017 includes time-tested vintners, new labels, up-and-coming regions and a diverse range of grape varieties—a microcosm of the wine world today. These are producers to watch in the coming months and years. U.S. Sparkling Wines: A free chart offers an alphabetical list of all U.S. Sparkling wines reviewed for the tasting report in this issue. Argentina: A free chart offers an alphabetical list of all Argentinean wines reviewed for the tasting report in this issue. Top 100 by Region and Variety - Here is a list of wine regions and varietals from which Wine Spectator's Top 100 wines originate. Here is a list of wine regions and varietals from which Wine Spectator's Top 100 wines originate. WineSpectator.com: BONUS VIDEOS: Join Wine Spectator's senior editors as they discuss this year's Top 10 in our annual video series. U.S. Sparkling Wines Alphabetical Listing - More than 130 wines were reviewed for this report. A free alphabetical list is available. WineSpectator.com members can access complete reviews for all the wines tasted using the online Wine Ratings Search. WineSpectator.com: BONUS VIDEO: Go into the cellars with Schramsberg's Hugh Davies for a sparkling winemaking primer. WineSpectator.com: BONUS VIDEO: J Vineyards winemaker Nicole Hitchcock explains Pinot Noir's role in her sparkling wines. Argentina Alphabetical Listing - More than 230 wines were reviewed for this report. A free alphabetical list is available. WineSpectator.com members can access complete reviews for all the wines tasted using the online Wine Ratings Search. WineSpectator.com: BONUS VIDEO: Find out how the Andes impact winemaking in Argentina. WineSpectator.com: XVALUES APP: Find ratings for more Wine Spectator recommended value wines with our free Xvalues app for iOS. WineSpectator.com: BONUS VIDEO: Executive editor Thomas Matthews interviews Ste. Michelle CEO Ted Baseler on the occasion of the winery's 50th anniversary. WineSpectator.com: Want more from Dr. Vinny? Our advice expert provides saucy answers to all sorts of questionsfrom tough topics about the technical aspects of winemaking to the finer points of wine etiquette, three days a week on WineSpectator.com. Submit your questions at www.winespectator.com/drvinny or on Twitter via @AskDrVinny. 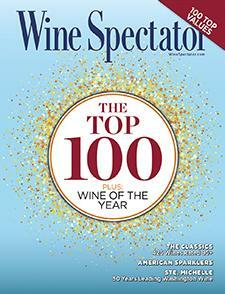 TOP 100 COUNTDOWN Join Wine Spectator's senior editors as they discuss this year's Top 10 in our annual video series. Plus, discover more original content. Find matching recipes and in-depth articles related to this year's Top 10. Take a look through wine history with our full set of Top 100 lists back to 1988. ENTER THE TOP 10 OF 2016 SWEEPSTAKES! Don't miss this once-in-a-lifetime opportunity to win a bottle of each of the Top 10 wines of 2016. Enter at www.winespectator.com/sweepstakes. HOLIDAY PARTY PLANNING We've recruited leading chefs to share some of their favorite dishes for seasonal entertaining, while Wine Spectator editors recommend crowd-pleasing wines that won't strain your holiday budget. WINE SPECTATOR VIDEO Watch all our great wine tips, winemaker interviews and tastings on your desktop, laptop, tablet or phone. Tune in each week for a new mobile-friendly video. How We Pick the Top 10: Watch our senior editors at work and find out what it takes to become the Wine of the Year. Ste. Michelle Wine Estates Turns 50: Executive editor Thomas Matthews interviews Ste. Michelle CEO Ted Baseler on the occasion of the company's 50th anniversary. 365,000 EXPERT WINE REVIEWS Consult our full database of reviews in our site's mobile-friendly Wine Ratings search. Find wines by score, price, region, grape, case production and more. Early Notice of Top Ratings: Our Insider and Advance emails, plus our twice-weekly Tasting Highlights. Cellar Management Tools: Create shopping lists, track purchases and more with the Personal Wine List. Education: Take Wine Spectator School's 10 online courses, from the ABCs of Tasting to seminars on food pairing and more. Recipes: Find hundreds of great matches for the wines you want to serve, from easy dinners to impressive holiday meals.